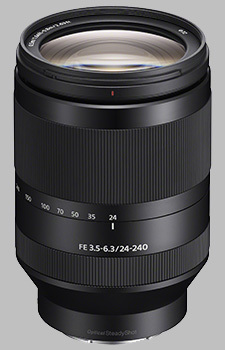 (From Sony lens literature) Sony's new "all-in-one" FE 24-240mm F3.5-6.3 OSS 10x zoom lens is an ideal travel partner handling everything from landscapes and everyday portraits to sports and action scenes with ease. Its huge 24-240mm range (10x zoom) makes this full-frame high magnification zoom is an ideal travel partner, covering focal lengths from wide angle to telephoto without the need to carry extra lenses. The advanced design includes five aspherical elements and one ED glass element, contributing to the lens' excellent optical performance in a compact design. It features an advanced linear motor that drives the focusing mechanism for quick, smooth response throughout the extensive zoom range, as well as built-in Optical SteadyShot (OSS) stabilization and dust and moisture resistance. The lens is decent in 24-70mm range, on the same level as 28-70mm kit lens. It's satisfactory upto about 100mm. Beyond that it degrades quickly and by 150mm it becomes very soft with poor resolution and contrast. It improves a bit by 240mm, but not by much. This softness may not be a problem if you only need web size images. Bumping sharpening and contrast in post-processing software will make small images look good. For large hi-res screen viewing or large print the lens is not suitable. The lens' image stabilization is average, about 3 stops. The lens is rather heavy for A7 bodies and extends significantly. Focus speed is average. Compared to Sony FE 70-300mm this lens is better focusing: faster and with fewer errors, but 70-300 is sharper in the whole range. The zoom ring is very stiff, which prevents zoom creep but also makes zooming jerky. You definitely don't want to zoom while recording a video. There is some play in the mount which combined with the stiff zoom adds to that unpleasant experience. Due to this loose fit the camera occasionally experienced blackouts when losing connection with the lens.